These are a selection of hotels I've personally reviewed and written about for StarServiceOnline and www.travel-42.com/, which are part of the Northstar Travel Media group of America. Their subscription service has over 10,000 individually inspected hotels, written by professionals, regularly updated and completely independent of any hotel influence or bias. This subscription service is primarily for the travel trade in the US and Canada, the following are just snippets from the full reviews. 138 years after Queen Victoria opened the original Midland Grand Hotel it reopened its doors as the St Pancras Renaissance in 2011 following a £150 million renovation. Built in 1873 by Gilbert Scott and saved from demolition in the 1960s by the poet John Betjeman this London masterpiece of Victorian exuberance has been reborn. Kings Cross is not the smartest part of London but St Pancras is a famous London landmark of dramatic high Victorian Gothic architecture in stunning redbrick topped with towers, spires and ornate chimneys. It is ideally situated for direct access to the concourse of the newly restored St Pancras International, the rail gateway Europe and the UK. The structure is a Grade I listed building so no structural alterations are permitted inside or outside so all the renovation has been within the confines of the existing building fabric. 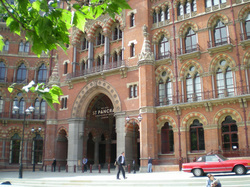 The hotel is the front façade of St Pancras station with a wide sweeping, cobbled concourse leading off the Euston road. Bowler hatted door staff welcome guests into the vast brick, iron and glass roofed lobby where plenty of luggage porters hover around the three reception desks. There’s an extensive central seating area where waiters serve tea, coffee, pastries and snacks. The Gilbert Scott bar and brasserie is a wonderfully Victorian gothic dining room that was the original entrance hall and retains its separate entrance. It has full-length arched windows, ornate marble columns, gold leaf detailing and hand painted ceilings. Celebrity chef, Marcus Wareing, from the Berkley operates the restaurant and serves updated British classics like Dorset jugged steak (braised featherblade with port, pork dumplings and redcurrant). The integral Pastry Kitchen offers classic favourites such as Bakewell tart with Cornish soured cream and revamped delicacies such as Flapjack parfait with Horlicks jelly. The restaurant bar is open for breakfast with a full English and an all day dining menu of quirky British bites including pork and sage stuffing balls and Lancashire mushroom rolls. Afternoon punchbowls are served alongside a cocktail list. The Booking Office Bar is off the main lobby and is another vast gothic hall with speciality Victorian and contemporary punches, served in hand-made copper punch bowls, as well as ales, ciders, perries and porters from historical and contemporary brewers across Britain. It has an extensive British menu including fish and chips, shepherds pie and bar snacks like Melton Mowbray pork pies and scotch eggs. Staffs are friendly and helpful but there was a slight air of chaos around reception but these are very early days in this reopened hotel. This is a one-off hotel and few city centre venues could provide such a unique opportunity to re-live the glamour of the Victorian era. There are no other top class hotels in Kings Cross so if guests want a traditional luxury style hotel then they would need to stay further west in Mayfair at the Hilton, Intercontinental or Four Seasons. The Haymarket hotel opened in Sept 2007 and is located in the heart of London’s west end, just off the Haymarket and a few minutes walk from Piccadilly and Trafalgar Square. The hotel is an entire block of classic Regency townhouses designed by John Nash the architect of Buckingham Palace. Kit Kemp designed the spacious, contemporary lobby in black and white with flashes of yellow and matching wall and sofa fabric. There is also a library with sumptuous, colourful Chesterfield sofas and chairs plus a rare ‘honesty bar’ for guests. A conservatory serves afternoon tea. Everywhere there are modern sculptures and large artwork by Peter Rocklin. Reception staffs are smart and efficient and door staffs are in regular attendance. The Brumus bar and restaurant has a brasserie style with large tables and bench sofa options. It is open all day with an emphasis on fresh, seasonal, organic produce with a predominantly English menu. There is an la carte service but snacks and cocktails are available throughout the day. The Haymarket hotel has great flair, being stylish and modern with plenty of luxury without any stuffiness. It is in a prime location with few competitors; the nearby family owned 22 Jermyn Street hotel is a small boutique hotel with an emphasis on old-world charm, at a lower price and also near Piccadilly. This five-story hotel has an impeccable pedigree since 1837 when Lord Byron’s valet first opened it. It was subsequently bought by the Ford family and is now owned by Rocco Forte. Located in the smartest part of London between Piccadilly and Berkley Square it is surrounded by exclusive galleries, cafes, bars and boutiques. A £19 million refurbishment in 2005 has ensured the 11 Georgian mansions that make up the hotel now have a seamless interior. 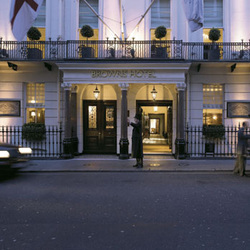 Agatha Christie fans may appreciate that her book ‘At Bertram’s Hotel’ is in fact Brown’s hotel. On a rainy afternoon they fielded three liveried doormen with umbrellas on the hotel step along with three more at the concierge desk immediately inside. There isn’t much of a lobby but guests are escorted to reception that is deeper inside the hotel. Staff efficiency is superb and guests are a clear priority. Brown’s has a more limited range of bar and dining optiomns than many large hotels but what they do have they do superbly. Classic old English service and hospitality starts at the front door and continues throughout the hotel. The Grill is the main restaurant providing all day dining and is very popular with non-residents. The cuisine has a strong traditional English emphasis but with some continental flair. The classic English roast and desert puddings are firm favorites. The roast is carved from a tableside trolley and a three course set lunch costs £37.50. Live jazz accompanies Sunday lunch. The Donovan Bar is a new and very stylish bar without a stuffy club atmosphere. Terrance Donovan photographs line the walls including some very risqué ones. A huge stained glass window depicting St. George illuminates the leather clad cocktail bar, which has a great wine cellar including vintage champagnes. Live jazz is featured every Monday – Saturday from 8pm and jazz is the general mood music at other times. The only way to sum up Brown’s is to say charm, charm and more charm with plenty of elegance, character and individuality. Its not cheap but this is the place to stay for a feel of old English personal service without any eccentricity or foibles but with every modern convenience. The Hilton is bigger, is luxurious and has more of everything but it doesn’t have that certain sense of style and grace or the level of personal service found at Brown’s. I loved its uniqueness. 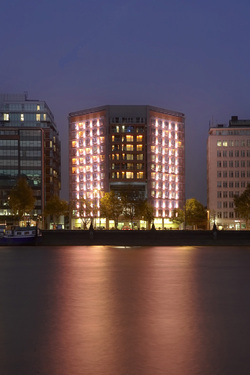 A rare new build large hotel in central London, opened in April 2005. Located between Lambeth and Vauxhall bridges on the Albert Embankment (south side of Thames) with great views of the Houses of Parliament. Faced with red brick/tiles covered with a glass fascia and a large sweeping drive-under canopy. Illuminated with variable colored lighting. The large modern main entrance strangely leads into the bar area rather than the reception. 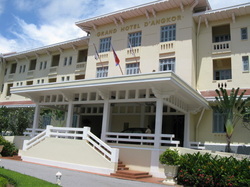 Staff are pleasant and helpful but three reception staff seemed insufficient during busy periods (all rooms were full). The brasserie is ‘Chino Latino’, separated from the lounge/bar by a glass wall. The menu emphasizes stir-fry and sushi but includes pasta, fish and steak dishes. The combined design is ultra modern Japanese style of dark wood, glass, exotic high-tech lighting and modern artwork. The lounge bar (also called Chino Latino) has a wide range of cocktails and wait service is optional. It also serves pasta and sandwiches from a separate menu. A separate breakfast room for guests is on the second floor. The stunning Thames room on the third floor has a 180 degree panoramic view of the Thames and Houses of Parliament, accommodating 300 for dinner. The Riverside Park Plaza is an absolutely stunning ultra modern high tech hotel with peerless business facilities. Excellent for leisure guest as well. It has a very good but not quite excellent location although the river taxis will provide rapid access to the City and business district. The Apex City of London hotel (opened November 2005) has a similar contemporary style and quality rooms but it lacks the business facilities, the general views and the spaciousness in its public rooms. Opened in 2010 the huge Park Plaza Westminster Bridge is the largest purpose built hotel in London. Located on the south bank of the River Thames directly opposite the Houses of Parliament this 16-storey, contemporary glass-paneled structure is near the London Eye and a five-minute walk from Westminster and Waterloo stations. Using the latest technology they have achieved a gold award from the Green Tourism scheme for their environmental efforts, which include on-site water bottling plant, triple glazing, thermal cladding and low paper use. Door staffs welcome guests at the bottom of an escalator that leads to a large second floor reception area, which has color changing LED walls and recently boasted a series of magnificent Dali sculptures. There’s a separate group check-in desk on the ground floor and another for penthouse guests who also have private elevators to penthouse floors. Italian, French and Japanese dining options provide a cosmopolitan choice in smart and stylish venues. 1WB Lounge and Patisserie is a spacious relaxation area off the lobby with sofas and lounge chairs. Its open for afternoon teas and waiters serve a selection of freshly made Chef Joel’s pastries and a tapas style menu. There’s also a bar. Ichi Sushi and Sashimi Bar– servers sushi and sashimi for lunch and dinner from an open kitchen; reservations are recommended and ask for the window table for great views. Primo Bar is a smart cocktail bar featuring live music every night and salsa dancing (and lessons) on Friday nights. It’s open until 1am and discreet areas can be booked for small groups. Despite its large size this state-of-the-art hotel manages to cultivate a boutique ambience with its discreet dining and drinking venues and private corners. In comparison the nearby Marriott County Hall hotel is in the grand Edwardian Baroque building that used to be the seat of London’s local government. It sits besides the Thames and has an old club ambience, which emphases traditional elegance but the Park Plaza is more state-of-the-art and its business facilities are far superior. Presiding over a privileged location amid the elite of London hotels the Four Seasons Hotel London at Park Lane reopened in the city's Mayfair area in April 2011 having been closed since 2008 for an extensive renovation. The highlight of the renovation is the 10th-floor spa and lounge with sweeping views across London. Luxury overrides environment here but all rooms have power saving when guests leave but all settings are cleverly saved on their return. The bland 1970’s exterior doesn’t do justice to the all-new interior but the welcoming uniformed door staff and the two gleaming guest Rolls Royce Ghosts rise expectations pretty quickly. Huge orchids line the black marble lobby, which has a hint of the orient with Chinese red, black lacquer, crystal and chrome décor and a surfeit of equine statues. There’s a discreet lounge, separate concierge desk, theatre desk and ATM as well as a currency exchange service. Breakfast, lunch, afternoon tea and dinner are available throughout the day & the unique new layout enables guests to choose the level of formality by dining in the restaurant, lounge or bar. The Amaranto restaurant, bar and lounge interconnect into a series of rooms; the pink, red and dark wood of the bar is contrasted with the restaurants bright and airy conservatory and the sumptuous clubby lounge. The Italian inspired à la carte menu is available anywhere including the bar or al fresco in the private garden overlooking Park Lane. The impressive wine cellar offers 250 varieties of wine, all of which are available by the glass. There is a separate entrance to the restaurant and bar, which is open until 11pm for visitors but much longer for residents. Regular live music is a lounge feature, either at the grand piano, violin, saxophone or classical guitar. Staffs are very welcoming and extremely efficient. The Intercontinental Park Lane is directly opposite the Four Seasons and is perhaps more family oriented, has more extensive business facilities but the Four Seasons is more about luxury. This 28 floor triangular tower has been a London landmark since it opened in 1963. It looks surprisingly good for its age and its prime location on Park Lane, overlooking Hyde Park, is second to none. However, Park Lane itself is no longer the home of the super rich, now it’s mainly the domain of large chain hotels. As well as the Park Lane entrance there is a more discrete/celebrity entrance at the rear. The liveried doorman welcomes guests into an attractive marble lobby but don’t expect to be able to sit and wait, as there is just one sofa and two armchairs – this is a policy decision to stop guests cluttering up the lobby. There are plenty of reception staff that are friendly and efficient and a separate executive check-in on the first floor. Podium Restaurant and bar opens directly off the lobby but also has street access. It offers all day dining from 7am until 1am. There is a buffet breakfast, set lunch menus and a la carte dining - all with a Mediterranean style. It also has a bar and small coffee lounge. Galvin at Windows is Hilton's Michelin starred flagship restaurant on the 28th floor and is the highest hotel restaurant in London. A cleverly designed raised floor in the center of the restaurant ensures that all diners can enjoy the stunning panoramic views and the adjacent bar where cocktails cost between £10-12. The old viewing gallery is no longer open to the public but the bar, with waiter service, is open to non-diners. English chef Chris Galvin offers seasonally inspired modern French haute cuisine and à la carte dining. Trader Vic’s is a franchise restaurant with its own bar open from noon till 1am (3am at weekends). It is a Polynesian themed restaurant located down a spiral staircase from the lobby or directly from the street. Décor is bamboo, facemasks and theatrical tropical colors. Cuisine is spicy Polynesian but with plenty of standard international options. Meat is cooked in large wood fired ovens, which are impressively on display beside the kitchen. An exotic tropical cocktail menu is available. The Pop Bar is a small intimate bar directly off the lobby. It has an ultra modern décor, enhanced with Peter Blake pop art on the walls and staffs wear Vivian Westwood designer gear. This is a chic champagne bar where champagne is sold by the glass or in tiny bottles – with a straw! The Zeta Bar is a casual environment and more of a nightclub than a simple bar and is accessed from the lobby or a street door. It is open from 10.30pm until 3pm and has a £10 cover charge after 10pm for non-residents. All drinks are made from freshly squeezed juice and a specialty is a fresh chili based cocktail. Bar food is available from the upstairs kitchen. 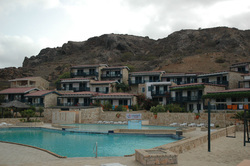 This very large and busy hotel is popular with up-market groups and has a 45% US occupancy. It has the predictable high quality of a flagship Hilton and its wide selection of dining and bar facilities is exceptional. It offers some of the best skyline views of London but to my mind lacks the charm, character and very personal service of the smaller, quintessentially English hotel, like the nearby Brown’s. 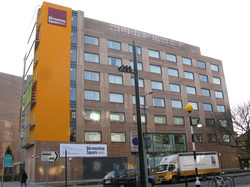 Opened in 2009 the Bermondsey Square is a boutique hotel that’s off the beaten tourist trail in an up-coming part of London. The area has a city village atmosphere with local markets, galleries, restaurants and coffee shops and is located an eight-minute walk south from Tower bridge. The exterior has the rather uninspiring look of an office building, which belies its chic interior and its energy efficient design. The entrance is into a small lobby, which opens directly onto the bar and restaurant area; there are no door staff and reception staff are bright, cheery and very helpful. Alfie's Bar & restaurant is on the ground floor overlooking the square and has a stylish open kitchen. Chef Andy Nolan sources most food from local markets and enjoys banter with his diners. Food is traditional British fare but with a good pinch of international flair. Breakfast options include a fast continental buffet or a more leisurely cooked to order table service. The bar stays open until 2am or later for residents. Top floor corner loft suites have spacious roof top terraces with panoramic views. Lucy has an eight person hot tub and Lilly has a hammock and a great view of Tower Bridge; the other two suites have balconies. Staffs are young and trendy, knowledgeable and very helpful. The Bermondsey Square hotel is an ideal getaway from predictable chain hotels in an up and coming area of London, which is full of local character instead of tourists. The nearby Hilton Tower Bridge is more expensive and much larger in every respect but its only extra feature is a very small on-site gym; it also has no on-site parking and is on a very busy thoroughfare. 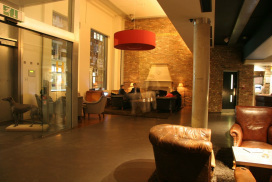 The Hoxton is a new build hotel opened in Sept 2006, which labels itself an Urban Lodge. It is five minutes walk from Liverpool Street mainline station and Old Street tube station and is convenient for London’s financial district. The Hoxton is the first foray of Pret a Manger founder Sinclair Beecham into the hotel business and its styled on his successful ‘quality but simple’ coffee/sandwich shop Empire. It boasts and achieves an innovative urban luxury-budget style, cutting frills like chocolates and overpriced minibars and concentrating on style, comfort and value. The entrance is sleek, stylish and spacious with a high ceiling adorned with hanging eagle sculptures. There are two large imposing log fires at each end of the open plan lobby with modern but comfortable leather sofa and armchairs. The bar and restaurant open off the lobby and the reception is well staffed with friendly, efficient staff. There is also an ATM and four complimentary computer stations. The Hoxton Grille is a stylish contemporary brasserie and lounge bar offering all day dining with comfortable mustard leather banquette booths. There are exposed pipes and brickwork, high ceilings, contemporary artwork and a courtyard for summer dining and smokers. Cuisine is contemporary transatlantic with a French and New York emphasis from chateaubriand to burgers and British bangers and mash. There are no on-site recreation facilities and the lobby reception has a convenience store selling snacks and drinks at retail prices. A stylish modern hotel with some frills often missing in 4 star hotels. Sinclair Beecham’s ‘no rip off policy’ is genuine with free Internet and computers, free Lite breakfast, complimentary newspapers, fresh milk, retail price snacks and drinks to stock the room fridge and 5p/min telephone calls to USA. The Apex City of London Hotel is more central for the financial district, it has some larger meeting rooms but its public areas lack the style and space of the Hoxton and the prices are substantially higher. Originally a 1664 country House Danesfield was rebuilt in 1725 and again in its present Italian Renaissance style in 1897. Built from local limestone it opened as a luxury hotel in 1991. It has a grand terrace, beautiful formal gardens and topiary set in 67 acres of the Chiltern countryside. There are superb views over the Thames between Henley and Marlow and it is located about 40 miles west of London (a hour by car). 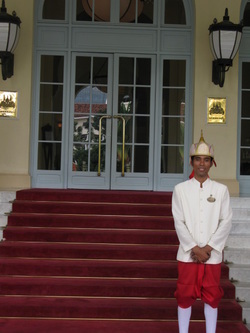 A doorman welcomes guests and guides them to reception, bar or restaurant. The attentiveness and the high staff ratio ensure a high level of service and a friendly welcome. The original Oak Room restaurant is now the Michelin starred Adam Simmonds at Danesfield House. The oak paneled and tapestry covered walls of the cocktail bar has waiter service; drinks can also be served in the Grand Lounge with its huge log fire, high beamed ceiling and comfortable armchairs. There is a stunning sea blue mosaic tiled swimming pool and whirlpool decorated with large hand painted murals. The eight treatment rooms offer 50 treatment options (using Molton Brown cosmetics), fitness studio, gym, sauna, steam room solarium, beauty treatments and a cool sounding Zen lifestyle studio. For sportier guests there is a croquet lawn, tennis, snooker, putting green, jogging trail and an adjacent to 18-hole golf course. Also archery, clay pigeon shooting and falconry can be arranged for groups. 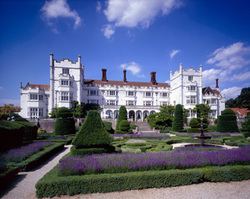 Danesfield has an attractive old world country house ambience but without any undue stuffiness. It is very well managed with attentive staff and a high standard of personal service. The hotel prides itself and succeeds at creating a friendly, family atmosphere. The quality compares very well with the nearby Cliveden Country House Hotel, which has a more illustrious and infamous history but is more formal and considerably more expensive. Opened in July 2007 this cleverly designed and perfectly located airport hotel is not near the airport it is actually inside the international arrivals terminal at Gatwick airport. On exiting customs at south terminal immediately turn left and take the elevator (next to Costa Coffee) to the VIP lounges on the first floor (also signposted for Yotel). It is a unique concept in airport hotel design based on BA first class aircraft cabins but with more privacy and space but none of the usual hotel frills. Three automated check-in terminals enable guests to confirm their Internet booking with their credit card and receive their electronic room key. Checkout and billing is identical and any extra hours occupancy is automatically charged. Following the aircraft theme the reception is called the ‘galley’ and staffs are called ‘crew’ and are on duty 24 hours for walk-in bookings (not recommended), food and drink and any problems. Food and drink can be ordered via each rooms built-in TV and is delivered to the room or you can walk to the galley if you prefer. Alcohol, soft drinks and beverages are available along with a range of fast foods and ready prepared meals that are significantly better than the average aircraft fodder. Meal options include Lamb Chettinadu Curry, Singapore Noodles, Salmon and haddock Fishcakes, Butter Bean Tart. A fast breakfast box is available for quick departures. This is a stripped down hotel for airline passengers travelling through London. Its perfect for passengers waiting for onward flights or who want to rest and freshen up before tackling London or maybe want to arrive at midnight for a snooze before being first in the check-in queue. It has stripped out what the traveller doesn’t need and therefore doesn’t want to pay for – no superfluous space, windows, restaurant, bar, spa, pool, gym or fancy gilt luxuries. There’s a good bed, great shower, TV and food and drink.Yotel are now appearing at airports around the world. 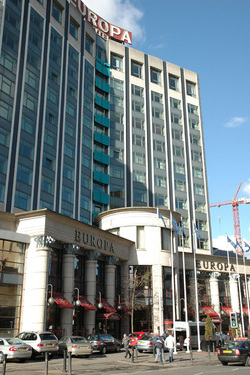 The Europa is the largest hotel in Northern Ireland but is more famous as the most bombed hotel in Europe (last one in 1993) and hosting president Clinton on his peace mission. This 30-year-old city center hotel has been comprehensively refurbished and is ideally situated for the business, entertainment and shopping districts. It is located near City Hall, next to the Grand Opera House and opposite the most famous pub in town (The Crown Liquor Saloon). A Romanesque colonnaded off road entrance fronts a traditional 12-story tower block. The vast brightly lit lobby is always busy; there are comfortable sofas and complimentary newspapers. Staff are helpful and efficient but there is usually a queue. The Brasserie restaurant off the lobby has all day dining but an uninspiring cafeteria ambience. The buffet style breakfast was equally uninspiring, as it had sat too long in heated containers. The first floor Piano Bar restaurant is more up-market and opens for dining from 6pm – 10.30pm. 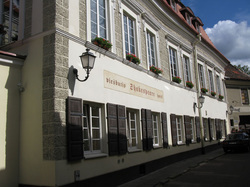 It serves a modern European and traditional menu accompanied by a piano player. The Lobby Bar is a traditional hotel bar with street access and provides a wide range of simple bar food from its own kitchen. The Piano Bar and Lounge on the first floor is more like a private lobby, it is the hub of the hotel and a major Belfast social venue for cocktails, informal business discussions and it has optional waiter service. The Europa has mainly corporate custom during the week and leisure guests at the weekend. It retains its prestige status but has an air of resting on its laurels and although it has a better central location it has been over taken by the Hilton as the preferred celebrity hotel. The nearby Holiday Inn has superior leisure facilities, is much cheaper although it does not have the Europa’s style and prestige. The Oban Caledonian is 200-year-old landmark building on the harbour front and the smartest hotel in town with fabulous views over the bay and the Hebridean Islands of Mull and Iona. It’s Adjacent to the railway terminal and opposite the ferry terminal so is ideal for all routes to the Hebrides and for exploring the wild and rugged west coast of Scotland. Its imposing stone exterior is complemented by an attractive multi million pound internal modernization but retaining its ‘bygone colonial roots’. The lobby is small with sofa, armchairs and log fire; the service is very friendly and helpful with valet car parking and porter service to rooms. There are three dining options; the elegant Restaurant Caledonian is the main restaurant with a daily changing menu specializing in local produce. It offers an excellent quality 5-course menu for $35. Café Caledonian is a more informal bistro style option, served from the same kitchen but also offering simpler snacks or just afternoon tea. The bistro opens into a traditional bar with sofas and tables. The Top Deck restaurant is not always open and is primarily used for banquets and special themed restaurant evenings. Breakfast is served in the main restaurant and there is a wide choice of fresh food cooked to order. Parking is extremely limited but valet parking is provided to a nearby car park. The central location means that shops and restaurants are within a minutes walk, as is the railway station and inter-island ferries. There are 59 rooms, Captain’s rooms are large, well furnished in an old colonial style with an ocean view, comfortable armchairs, large TV, complimentary tea, coffee, water, biscuits and fruit. Most rooms have a bygone colonial design and some have a nautical theme. The large luxury bathrooms are new with under-floor heating, Victorian roll-top bath and power shower. The hallway and staircase are wide as are the large wood panelled doors; creaking floorboards and an old gated elevator provide additional atmosphere. All rooms are non-smoking and two are fully wheelchair accessible. 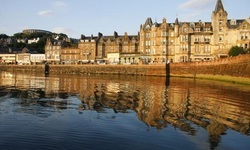 The Oban Caledonian hotel is well managed and well located in the centre of town, It’s a great hotel with a few quirks inherent in any 200-year-old building but with lots of unpretentious style and charm. Originally opened in 1865 the Café Royal in Regent Street has been a high-society café and a decadent nightclub, playing host to the likes of Oscar Wilde and David Bowie and was a favourite lunch venue of Winston Churchill and Princess Diana. December 2012 saw the protracted soft opening of this London icon after being closed for five years. Suited door staff welcome guests in a casual manner to the understated, and easily missed, Regent Street entrance but taxis arrive at a separate side-street entrance. A sterile entrance hallway leads to a pair of surprisingly down-market reception counters. The famously ornate Louis XVI style Grill Room with its elaborate gold leaf mouldings and mirrored walls has been fabulously restored. Sadly it’s no longer the Café Royals elegant dining room but has been transformed into an evening champagne bar with the ambience a gaudy nightclub. Ten Room is the main brasserie-style restaurant offering à la carte breakfast, lunch and dinner. Its open plan design adjacent to the side entrance has guests arriving, customers walking past to the bar and a balcony overlooking diners, all of which give dining a bustling and charmless ambience. Opening directly off the street The Café is an even bigger disappointment, its yellow streaked marble floor, walls and counter is stark and the counter service and predominant passing trade of shoppers give it zero style. The revamped Café Royal is not sure if it’s a contemporary hotel or a stylish part of history. With all the hype and history the revamp is a bit of a disappointment. A stunning welcome from smiling reception staff and all the staff came out to say welcome. It has an intimate family atmosphere and that the staff love their job is evident everywhere. I have never read such an effusive guest book full of positive comments. Staff all give their first names and according to the guest book they know the best quality and value restaurants in town. The small cosy dining room serves the most stunning breakfast, according to the guest book – wonderful crepes and the best eggs ever. There is no bar but an excellent café is next door in the small courtyard, unseen by other tourists. Standard rooms have all new furniture and fitments, comfortable king sized bed, there are velvet drapes, gilt cornice and part leather padded walls with hand painted carnival murals. There is a Murano glass chandelier, minibar, safe, direct dial telephone, desk, flat screen satellite TV’s are being installed, good closet space but no draw space. Some rooms have courtyard view and others have canal views over looking a gondola station. Bathrooms are small but clean and bright, fully tiled with combined bath/shower and bidet. Superior rooms have the same furnishing and style but are larger with an entrance hallway and a much larger bathroom with vanity unit and separate tub and shower. This is a superbly refurbished locanda (guest house or inn) in an excellent central location with rooms the same quality as the Marconi and the Violino d’Oro. The facilities are limited but it does not cater for business travellers and leisure activities are mainly art orientated and cultural. What makes it superior is the quality of the welcome by staff and the invaluable and genuine advice about the best places to eat and drink. 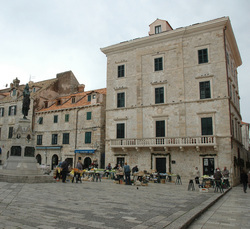 There are only two hotels within the Dubrovnik city walls and the Pucic Palace has a prime position overlooking Gundulic Square. Originally an 18th century grand house and in 1859 it became the first hotel in Dubrovnik. Completely modernized and upgraded in 2002 it retains the style and elegance of a grand house. Stairs and hallway have a Baroque style architecture with lots of stone, marble, columns and Italian lamp shades. The tiny reception and lobby have a boutique feel, which belies its luxury standard. Staffs are friendly and competent with excellent English. The French style Brassiere Café Royal is the main restaurant and seats 50 inside with a further 75 possible outside on the square. It is a deluxe Mediterranean style brasserie with a touch of Parisian flare. The up-market Razonoda wine bar is next door and offers a range of Dalmatian snack specialties as well as a good selection of wines and fine cigars. The Defne restaurant is only open in the summer and is on a large raised terrace offering contemporary Mediterranean cuisine. An Events coordinator can arrange excursions and car or boat hire, because guests cannot bring cars within the city walls there are two parking spaces outside the city walls and a porter collects luggage from the city gates. This is the only luxury hotel within the city walls and it has a perfect location in the heart of the city. Compared to the huge Dubrovnik Palace the Pucic Palace has an intimate and exclusive atmosphere, full of charm with antique furnishings and great style but with all modern conveniences. Severely damaged in the 1991 Balkan war the Dubrovnik Palace has been completely redesigned, refurbished and reopened at the end of 2004. There are ten floors but it looks low rise because it is built into the cliff side so that reception is on the ninth floor. 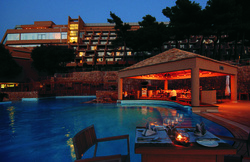 In its first full year it has won two awards for the best hotel and best spa & resort in Croatia. Located at the very tip of the Lapad Peninsula it is a 15-minute bus ride from the Pila gate of the old town. The number four bus conveniently terminates opposite the hotel door. The huge reception area has the most stunning glass wall view across to the beautiful Elaphite islands, complemented by a 20-foot wall of flowing water. Staff are very capable and helpful with perfect English. The main Elafite restaurant serves a rich buffet for breakfast, lunch and dinner. The Lenga restaurant offers fine dining on the best of local Dalmatian cuisine. The Maslina Taverna is more refined than the name suggests, it is informal and has the most stunning sunsets from inside or from the large terrace. The Sunset lounge bar is off the lobby and has panoramic views out to sea. The Lanterna glorijet bar is an attractive poolside bar with a swim-up bar area. The Oazarium bar is on the top floor by the wellness center and main conference hall, a sunny area with more spectacular views. There are eight other smaller bars linked to conference facilities. The nightclub Orlaninjo is open during the summer months and has special jazz evenings. There are excellent hotels in the Dubrovnik area but the Dubrovnik Palace is in a league of its own. The luxury hotel the Grand Villa Argentina has rooms and service to similar standards but it cannot match the range of conference, restaurant or spa facilities. Everyone visiting Dubrovnik should at least have a drink in the Sunset bar to watch the spectacular sunset over the Elephite islands. This seventeenth century Baroque aristocratic family mansion has a long literary heritage including readings of Shakespeare plays in the 1600s. It is a listed preserved building so cannot be altered or remodelled and opened as a hotel in 1999 with a major renovation in 2004. The Sonnets restaurant serves a wide international menu along with traditional Lithuanian dishes, such as noblemen's beat soup. It is a cosy and elegant, wood panelled room with a good wine list and selection of premium French cognac and Scotch malt whiskey. Breakfast is served either in the restaurant, the bar or on the rooftop terrace. Like everything at the Shakespeare breakfast is an personal experience; it is a la cart with freshly squeezed juice and everything cooked to order. The Globe bar is open from 6am until midnight and is crammed with old world charm - comfortble sofas, armchairs, rugs, old paintings and waiter or bar service. The attractive first floor rooftop terrace is also available for drinks and snacks. The staff are supurb and personal service is of the highest - whatever a guest wants they get, along with lots of complimenary facilities. This grand merchants house built in 1592 is ideally located in the heart of the old town, on a pedestrian street, at the foot of the castle and opposite the Holy Ghost church (beware the early morning bells). 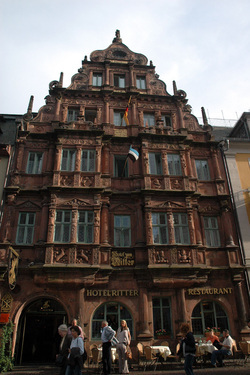 It has been a hotel for 350 years and is one of the oldest and most photographed buildings in Heidelberg. It oozes the classic charm of Renaissance Germany with an elaborately stone carved exterior, fluted columns and ornate roof gable. Guests are welcomed with a complimentary drink by extremely friendly English speaking staff. Taxis are permitted to drive through the pedestrian area to the hotel. The huge stone fireplace, wood paneled walls and suit of armor maintain the medieval air. There are three restaurants served from the same kitchen, which specializes in regional dishes especially game. English menus are available and the waiter service is excellent. The restaurant is popular with locals and guests from other hotels. The Ritterstube seats 60 persons in a more refined ambience, which is non-smoking. The Belier seats 85 persons in a more informal ambiance and smoking is permitted. The Ratsherrenstube seats 85 persons and is available for private function or as an overspill at busy times. Breakfast is exceptionally good with the usual continental style plus hot bacon and sausage, smoked salmon and bucks fizz. There is no hotel bar, as there are so many local bars, although guests can be served drinks at any time. The Hotel Ritter is without doubt THE place to stay in Heidelberg. Although the Crown Plaza has an attractive facade and a pool it does not have the unique history or individual style of the Ritter and nowhere can match the perfect location at the foot of the castle. Built in 1853 as an aristocratic mansion, located on the Moika river and it is ideally positioned opposite the Winter Palace (Hermitage museum). After an extensive renovation it opened as a Kempinski hotel in 2006. Welcoming uniformed door staff, greet guests with friendly, impecable English while porters take charge of luggage and deliver it to your room before you get there. The huge marble lobby has multiple reception desks, a separate concierge desk and is amazingly lit with dozens of huge candles in the evening spread across the black, white and red marble floors. There are plenty of antiques around the hotel and after a visit to the Hermitage its a joy to be able to touch and use these beautiful objects. Bellevue Brasserie is a rooftop restaurant with 360 degree views and two rooftop terraces. 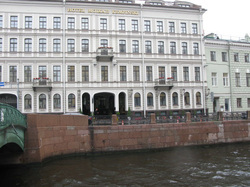 It serves an international menu from 12 Noon to 1am (3am in high season) Casual or formal dress is acceptable and the views across the city and the Hermitage Museum (the old Winter Palace) are spectacular. The large horseshoe shaped stainless steel bar has a wide selection if international drinks and the restuarants season Kamchatka (King crab) crab Waldorf salad was to die for. Beau Rivage in the lobby serves a buffet breakfast from 7-11am with added a la carte options of a staffed fresh juice bar and eggs however you like them. The Tea Room offers traditional English style afternoon tea (15 types) beside an open log fireplace, overlooking Palace Square and the Hermitage, surrounded by imperial Russian porcelain and a silver. Open from 11am-7pm. The Von Witte lounge and bar has the atmosphere of a gentlemen's club, it is one of the original mansion rooms, with an open log fireplace, leather armchairs, a library, and great views over the Moika River. Light snacks are also available including club sandwich with crab and caviar and is open from 8am to 1am. The Wine Cellar 1853 is a wine bar in the brick lined cellar of the old mansion, as well as old and new world wine it has a great selection of French cheeses and regularly offers Swiss style fondue. Open from 6pm until 11pm (closed during summer period). The staff really do go out of their way to help and are very knowledgeable about the hotel and the city. The Radisson SAS Royal Hotel, St Petersburg is nice enough and is closer to the Moscow bound railway station but it does not have the style or great location of the Kempinski and its directly on the noisy Nevsky Prospekt. Located two miles from Carrickmacross in south Monaghan, and just off the Dublin to Monaghan road (N2). The long, imposing entrance and drive leads to a traditional country house that’s been substantially extended and renovated. The sumptuous lobby has the air of a modern country house with rich carpet, heavy wallpaper and portraits. Large armchairs and coffee tables form an integral lounge area and an elegant Victorian style withdrawing room offers more privacy for guests. The award-winning restaurant serves classic continental cuisine, locally sourced produce and an impressive seven course special menu. There is an extensive and stunning wine list enhanced by a state of the art glass chilled wine room with vacuum sealing of bottles so that expensive wine and champagne is available by the glass. The bar is classically large with an elegant club style atmosphere with optional waiter service. Drinks can also be ordered from the lounge and terrace. The golf club house has a separate bar and dining facilities. There are tennis courts but it’s the championship golf course surrounding the hotel that’s a major attraction. The clubhouse and pro shop is a 5-minute walk through the grounds. The attractive swimming pool has large plants and a comfortable lazing area. The fitness room has state of the art equipment with individual TVs, sauna, Jacuzzi, steam room, massage room, therapy rooms and a very extensive range of beauty treatment options for golf or business meeting ‘widows’. Rooms and suites have an elegant old world style as befits the country house ambience. Heavy drapes with matching spreads, polished mahogany desk, deep comfortable armchairs and sofas, deep pile carpet and large comfortable beds. Bathrooms are a good size including shower and tub with bright clean tiles and good lighting. The hotel attracts a mixed clientele of businessmen, social events and tourists looking for quality accommodation and top leisure facilities. Located in the centre of Tirana close to the University, financial and banking district and 30 minutes from the airport. The Sheraton is a city landmark in itself, black glass, cement exterior with large entrance canopy. The grounds are not particularly attractive and the exterior could do with a clean and some minor repairs but it’s still the smartest building in town. The lobby is large, airy and modern with three small reception desks with guest chairs for a more personalised reception. There is a large comfortable lounge in the lobby area leading out onto a spacious terrace. The dining room, the Metropolitan, has a glitzy art deco style providing international and local cuisine but regular US guests say it is overpriced and not to the standard of good local restaurants. There is also a small food court in an integral shopping mall offering Mexican, Italian and Asian dishes along with three bars offering snack food. A smart and very comfortable Lobby bar is complemented with the three more informal food court bars downstairs. The mall has a very large TV screen for sports and special events. 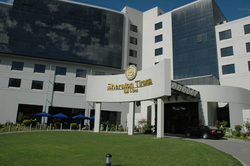 Sheraton Tirana is a well-managed property in a class of its own for Albania so the absence of competition makes it a little complacent. The only competitor is The Rogner, which used to be considered the best hotel in Tirana. However, it looks tired beside the Sheraton although it is a very acceptable alternative for US guests and is still popular with local people for special functions. Located three kilometers west of the city centre on the road to the airport. It is the most prestigious hotel in Macedonia; guests have included Prince Charles, Tony Blair and many sporting celebrities. The exterior is not particularly attractive although the arched balconies and corner spiral staircase give it some character. The grounds are extensive but are not landscaped or attractive. The entrance is faced with Macedonian marble and the huge atrium lobby makes an impressive reception. The lobby has murals of well-known Macedonian landmarks, there are large plants, a fountain, a comfortable seating area and bar. A TV lounge and a pressroom are adjacent. The dining room can seat 150; there is also a large terrace and a small private VIP dining room. A tennis bar behind the hotel offers more informal dining and daytime snacks. A separate kitchen provides dining for conferences and banquets. Cuisine is international with an emphasis on local specialities; prices are surprisingly low for a 5 star hotel although breakfast was only up to a 3 star standard. The lobby bar has a spacious ambience with comfortable chairs, piano music at weekends, waiter service and it has become a meeting place for informal business discussions. The separate tennis bar has an attractive terrace area with mountain views, unfortunately a massive new national sports stadium is being built next door which is noisy and will ruin the view. There is a small on site casino with a separate entrance and six new tennis courts. An excellent fitness club has an on-site coach, sauna, jacuzzi, massage… . The Aleksandar Palace is easily the most prestigious hotel in Skopje where all visiting dignitaries and celebrities would stay. It is a well-managed hotel where any visitor would feel comfortable and safe, food is its main weakness. 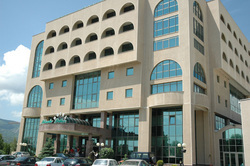 Its main competitors are Holiday Inn and Best Western in the centre of Skopje. Minois Village Hotel is located on the west coast of the island, three km south of the main port of Parikia and six km north of the domestic airport. 2-3 hours by ferry from the Athens port of Piraeus and 25 minutes by 40-seater turbo prop plane from Athens international airport, Parikia is also a hub for many other inter-island ferry routes. Complementary airport or port transfers are provided. A simple family run hotel of mainly self-contained studio rooms and apartments but no large hotels are permitted on the smaller islands. Designed with a traditional Greek village layout of paths, courtyards and steps. Wonderful sea views from most apartments and dramatic sunsets. It operates from 20 May –30 September and unusually for many Greek accommodations the grounds are beautifully kept and courtyards bloom with perfumed flowers. A short coastal walk across the hotels herb covered hillside brings you to a reasonable beach with sun beds, beach umbrellas and beachside tavernas. The reception desk is manned from 7am to midnight but there is a 24-hour mobile phone link to the on-site family. There are comfortable inside and outside lounge areas with poolside or fabulous sea views. The Avli restaurant is a stylish taverna with stunning sea views open from 19.30 until 23.30. The pool bar opens at 08.00 and serves snacks as well as drinks until midnight. Breakfasts can be hot or continental with fresh juice, bread, coffee, cheese, meal, yoghurt and home made cake. This is a small friendly, family run hotel-resort with a high level of personal attention. Ideally suited to guests requiring a quiet, away-from-it-all vacation, with a Greek ambience, but to a much higher standard than commonly found in Greek apartments or four-star hotels. Opened in September 2010 this purpose built hotel is adjacent to the the huge Siam Paragon shopping mall and the BTS Skytrain Siam station is just minutes away. Its in the heart of the upmarket shopping and entertainment district and the entrance is tucked away off the busy Rama1 Road but can be a little difficult to find. The 17 story building has a triangular structure that completely encloses the central pools and garden area. The cavenous lobby is an oasis of calm from the frantic Bangkok streets. Door staff abound and luggage is whisked from taxi to room. Check-in is perfection - guests are guided to a sofa, offered a cold flannel, an iced drink and then check-in happens while you relax. The Executive Lounge on the 17th floor has fast check-in and checkout service but its hard to see what could be better than not doing it at all! The Sra Bua by Kiin Kiin restaurant has a contemporary ambience serving traditional Thai dishes but with some contemporary interpretion (ie frozen red Thai curry) for both lunch and dinner. The Brasserie Europa is a European style restaurant offering an international menu for breakfast and all-day dining, with inside or terrace dining options. The Rotunda is an informal but slick garden bar and restaurant surrounded by pools, water features, palm trees and gardens. Complimentary fruit and water is provided for guests. The bar is open from 09.00 to 19.00 and the restaurant serves grilled & healthy options from 11.00 to 19.00. 1897 Bar is a modern version of a gentlemen's club with a wide choice of cigars and a good selection of fine cognac and wines, inside with leather armchairs or outside on a private terrace. The T lounge is open from10:00 - 23:00 and looks out onto a garden terrace where it offers a range of 60 teas from around the world. In the evening a pinanist entertains and live music is a regular feature. Staffs have good English, are well trained and exceptionally polite and hospitable, they are also very knowledgable about hotel services and local sights. Bangkok is well served with top class hotels, the nearby InterContinental has similar facilities and service levels but it does not have the artistic flair of the Kempinski nor does it have the 'city resort' ambience created by the multiple pools, poolside bar and direct pool access suites. El Questro is open from 1st April until 31st October each year. It is a one and a half hour drive (or 30 minute helicopter transfer) west from Kununurra, located in its own million-acre Wilderness Park within a breathtaking and primal outback landscape. The building is a single story luxury home with six guest rooms. Arrival is perfection itself, there is no check in; guests are welcomed by name with cold towels and French champagne whilst bags are taken to the room. The manager escorts guests from the vast airy colonial style lounge to rooms and explains a little about how the Homestead operates. With such small guest numbers meals are a social occasion and an opportunity to exchanges adventure stories from the day’s excursions. The stunning free-form open-air pool overlooks the Chamberlain Gorge and the wild open Kimberley ranges. It has shady areas, sun loungers and a waterfall cascading down to a spa. 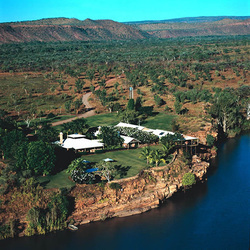 The El Questro Homestead is a stunning and unique one-off experience. It cannot be described as a small boutique hotel because the level of personal service is outstanding. Guests are treated like family visitors and nothing is too much trouble. A major redevelopment has taken place at the El Questro Homestead since I stayed there but its in the same place and can accommodate a few more people. The 27-acre Cable Beach Club is a colonial style complex set back from the road amongst tropical vegetation and has an oriental pagoda style entrance. Opened in 1988 as a business venture by Lord McAlpine it has a traditional 19th century Pearl divers design. It is the only hotel on the stunning 22km Cable Beach and is one of Broome’s icons about four miles from the town center. The entrance and lobby are full of oriental antiques collected by Lord McAlpine and the theme continues through the rest of the hotel. The large lobby is well staffed with friendly and efficient staff there is also a concierge who transfers luggage, and optionally guests, by golf cart as well as a guest relations desk. The Club restaurant offers award winning fine dining amongst oriental antiques and Sir Sydney Nolan original artwork. The Kimberley Bar-b-Q is a classic all you can eat option, popular with families and located beside the family pool. The Sunset bar and restaurant overlooks the Indian Ocean and offers breakfast, lunch (seasonal) and informal dining at a surprisingly low price. The Boardwalk café and bar outside the Club restaurant offers informal snacks on comfortable can seating and an evening tappas menu. The Cable beach Club resort is by far the best hotel in Broome. Compared to the nearby Mangrove hotel it has a higher level of personal service, more organised activities, more restaurant options, a unique beachside location and has an iconic status in Broome. 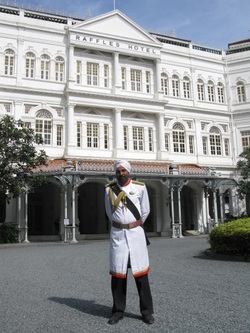 Just about every visitor to Singapore stops by at Raffles - some just to take photographs of the dazzling white colonial facade or the famous 6'6'' Sikh 'doorman'. Even more people come to shop at the 44 exclusive shops in the Raffles arcade or dine in some of the 15 different bars and restaurants. As Singapore's most famous landmark and an emblem of style and luxury Raffles has been designated a National Monument, to safeguard it from developers for future generations. Like everything at Raffles dining options are over the top with a dozen venues to choose from. Tiffin is properly defined as a light mid-day meal but in British colonial days it came to mean a mild chicken curry and that’s still on the menu in the regal elegance of The Tiffin Room; as well as breakfast and high tea. The Raffles Grill is a formal dining venue offering contemporary French cuisine in a more intimate setting. The Bar and Billiard Room, one of the few original rooms, serves lavish international buffet and a weekend champagne brunch. It still has two full-sized billiard tables. The Long Bar Steakhouse is upstairs adjacent to the world famous Long Bar where the original Singapore Sling was invented. This all-suite hotel is spectacular and I've never felt so at home in a hotel before. The large front door leading off the magnificent teak verandas (with comfortable chairs and table for each suite) leads in to a high ceilinged parlour with dining table, armchairs and discreet TV. This leads into the vast main room with period furniture, an antique desk, king sized bed, more armchairs and all the usual facilities. After that there’s a large dressing room with twin washbasins and off that is a separate bathroom and shower. Personal butlers are standard and frequently enquire if there is anything you need. Sitting out on the balcony I had my mind read as the lady butler appeared with trays of tea and coffee just as I was thinking, 'humm, I fancy a ....' - absolute genius! 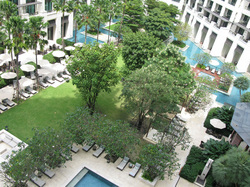 The hotel covers an entire city block and a quarter of the grounds are given over to nature and greenery. Outside my suite were towering Livingstonia palms, fragrant frangipani trees, innumerable flowers and an immaculate lawn. Everything about Raffles Singapore is a one-off and it’s a true icon of the hotel world. No visitor to the city should dream of missing Raffles off their itinerary regardless of whether its for an iconic drink, an elegant meal, a luxurious stay or a simple photographic memento. My $2 tuk-tuk ride deposited me on the sweeping drive of Raffles, just behind a gleaming black limo but the Khmer liveried door staff unloaded my bag with the same grace and welcome as they had shown to the limo occupant. I was ushered to a comfortable lounge chair, given a welcome drink and a cool flannel, whilst someone else took care of all the bothersome check-in details for me. Opened in 1929 the French colonial Le Royal has always been THE place to stay in Phnom Penh and suites are named after notable guests including Somerset Maughan, Jacqueline Kennedy and Charles de Gaulle. It saw some rough times during the Khmer Rouge era in the 1970's but has been returned to its former glory with new extentions and renovations that update facilities but reatain as much original restoration as has been possible. La Phnom is not just an in-house bakery but the pastry chef will make guests a cake of their choice. The Conservatory, with its colonial grandeur, is an elegant place to take high tea, especially when listening to live classical music. Cafe Monivonh offers buffet or a la carte service, western and Asian cuisine, while seated in wicker armchairs at marble tables. Its also the breakfast restaurant, inside or on the verandah, with whirling ceiling fans, birds chripping in the tropical trees and staff buzzing around to ensure that everything was perfect - which it was. Raffles Phnom Penh is a haven of lazy charm, reminiscent of days gone by, but with just the right level of pampering and is an unmissable Phnom Penh experience. This is without doubt the most stylish and romantic place to stay in Siem Reap - French colonial style, with hints of 1920's art deco, suffused with Khmer charm but with all the frills of modernity. If you’re in Siem Reap you’re obviously going to go to Angkor Wat and Raffles is bearly a ten minute drive away. The raised porch at the front wa apparently designed for guests to easily mount elephants for a regal trip to the famous Khmer site. Cafe d'Angkor brasserie serves international cuisine all day and a complimentary buffet champagne breakfast for guests in the morning. The Conservatory looks over the terrace and gardens and its a good place for a quiet afternoon, high tea and after dinner the resident pianist entertains or wafts guests to bed if they're planning an early morning start to Angkor Wat. As well as fine dining there’s the thrice weekly evening BBQ on the Apsara terrace, under the stars or sheltered from the warm tropical rain. Its a travesty to call it a BBQ when there are nine separate buffet options - straight-up BBQ, Tandoori, Noodle bar, Stirfry, Amok, a Khmer kitchen, a Salad bar, Deserts and an exotic Flambe station. But the highlight of this gourmet BBQ is a spectacular performance by a young Khmer classical dance troop - stunning costumes, beautiful dances and the genuine pride in their culture added a real sense of authenticity. The rooms of course are superb, full of home comforts but with extra treats like a bowl of very exotic fruits, elephant chocolates and toiletaries from the Amtita spa range. The breakfast buffet has a lazy colonial feel with table service of fresh squeezed juices, cappucchino coffee, eggs cooked to order and a daily newspaper. The exceptionally large pool is surrounded by flowering Frangipani trees with coconut palms waving majestically behind them. There are lotus pools, towering betelnut and sugar palms, ginger, orchids, lillies after which I gave up trying to count the exotics in this manicured slice of tropical jungle. Lion fountains tinkle in the background to the accommpaniment of bird song and for those that still need help unwinding there's the Amrita Spa for a Khmer style massage and an array of natural treatments But for those who have already unwound the poolside bar has an extensive selection of cocktails, champagne and great local beer. 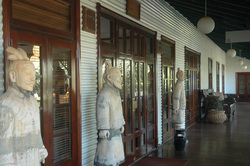 A well restored hotel, which echoes the rich cultural heritage of its surroundings. It’s a captivating blend of traditional grandeur, contemporary comfort and Raffles’ distinctive service and style, all with a touch of Khmer style. 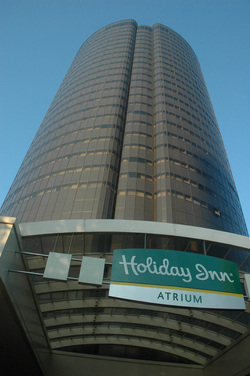 In a city of spectacular buildings the Holiday Inn Atrium is an impressive 27-floor tubular glass structure. The large covered entrance with palm trees, flowers and several fountains is a respite from the busy roads surrounding the hotel. There is little of interest in the immediate vicinity but it is only a 5-10 minute free shuttle bus ride to the shopping and business districts and a 25-minute drive to Changi international airport. The reception is well staffed, efficient and helpful and staffs generally have good English. Liveried doormen greet new guests and there are express checkout facilities. The tropical palm filled lobby is the hotel’s crowning glory with its stunning atrium rising to the glass roof on the 27th floor. The fourth floor Melting Pot Cafe overlooks the atrium providing breakfast and all day dining. Evening dining is either buffet or a la carte and includes western dishes as well as local Asian specialities. The Xin Cuisine Chinese reasaurant provides fine dining with Hong Kong chefs providing authentic Cantonese cuisine. There are set menus and a la carte which includes braised Sharks fin, Abalone and Jellyfish platter, deep-fried Frog and double boiled birds nest. The Poolside snack bar offers a simple menu and has waiter service. There is a rooftop pool and a children’s pool on the sixth floor; a large terrace with palm trees and Bougainvillea surrounds it. There are plenty of sun loungers and tables but no interesting views. There is also a small fitness room and a tennis court. The Holiday Inn Atrium puts more effort into its front of house service and facilities, which is not always matched by its room standards. The authentic Asian menu and high staffing levels tell you it’s not a typical Holiday Inn from home. The nearby Copthorne King felt claustrophobic by comparison with low ceilings, a windowless café and a significant shortfall in personal service. I liked the good quality service and the stylish ambience at the Holiday Inn Atrium. Built in 2009 this low-rise hotel is in the Dhofar region of southern of Oman. Perched on the edge of the Arabian Sea its sand coloured paintwork, crenulations and domes give it attractive local character. There’s little to commend the immediate neighbourhood, which is 80 kilometres from the main town of Salalah and the International Airport. Good environmental measures include recycling treated waste water for irrigation and reduced electricity consumption by the use of low watt light bulbs. A sweeping drive leads to the huge portico entrance where guests are welcomed and efficient door staff deliver bags directly to guest rooms. The Sumhuram restaurant and terrace offers buffet or a la carte options for breakfast, lunch and dinner and is open from 7am-11pm. It serves an international menu with a range of Omani specialities. The vast freeform outdoor pool is more like a lake than a typical pool, there’s also an in-house dive centre, water skiing, kayaking, tennis and a 20-station gym. Staffs are smart, competent and well trained and create a welcoming atmosphere. 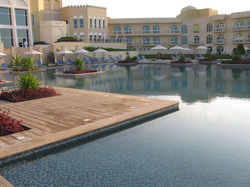 There are no comparable hotels in the immediate neighbourhood but the Crown Plaza in Salalah is better placed for town based activities and has a more attractive beach with a beachside restaurant and bar. This Italian owned low-rise beachside property is a few minutes drive from the island capital of Sal Rei and 20 minutes from the airport. It has well planted grounds and rooms are arranged in small groups of 3-4. This 1996 resort is built into the hillside in the style of a stone built hillside village and has been regularly extended. Staff are on duty at the gate and the reception is open from 7am-11pm. Reception staff are friendly and efficient with good English. Luggage is delivered to rooms along steep and uneven pathways. The main dining room provides buffet style dining with a wide selection of Italian and international dishes. Dining staffs seemed poorly trained and there was plenty of chipped crockery but the food is good. The main bar beside the restaurant has an attractive pier jutting out to sea with seating and dining area at the end. There were two large outdoor pools that were in need of cleaning and a poolside snack bar provides drinks and a brunch menu. Pool towels are provided and there are sun loungers on the small private beach. The Marine Club is an attractive complex and the superior rooms are good quality as is the food but its let down by poor service standards. It has an intimate ambiance compared to the vast, sprawling Venta Club resort a few miles away. The Venta Club is all-inclusive with a better beach but all the style and ambiance of a theme park. Built in 2001 the Inter-Burgo is a typical western style hotel with a Spanish heritage influence. It has six floors above ground and is the largest and smartest hotel in Daegu. Located on the left bank of the Geumho River it is about five kilometres from the city centre and close to Daegu International airport. For a city hotel it has exceptional dining and recreational facilities, which make it more of a city resort-hotel. 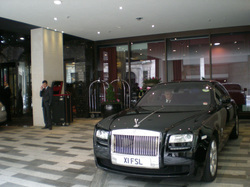 There are plenty of door staff and baggage porters and the vast marble lobby has a well-staffed reception. The lobby décor reflects the owner’s Spanish links with wine casks, suits of amour and a Spanish cultural centre. There are comfortable leather sofas and armchairs, modern artwork, palm trees and chandeliers in every available place. There is a surfeit of restaurant options and waiter service is standard everywhere. The Madrid offers western style Mediterranean dining with beautiful views and fountains. Private dining rooms are available. Dong Bo Sung is a traditional Chinese dining option in an authentic setting. The Granada is like an up-market food mall with up to 150 western and oriental food options. Fresh food is continually cooked and augmented with a huge buffet. There are general tables, discrete alcoves and a private dining room. Un Hae is very authentic providing traditional Korean and Japanese cuisine in public and private settings. Poema is the main buffet breakfast venue and a coffee shop during the day. The Montblanc bakery is in the lobby serves fresh cakes and has a small seating area. The Rose garden – pub and cocktail bar is up three flights of stairs (no elevator) and is the only indoor smoking venue. The Patio Lobby bar has a traditional bar and a vast comfortable lounge area with panoramic riverside views. The Beer Garden has a large terrace by the swimming pool in the Inter-Burgo annex, serving Korean and western style snacks. Sevilla is a group of three private karaoke rooms serving beer, cocktails and snacks. The Inter-Burgo has incredible leisure facilities for a city hotel, an exceptional range of dining options and the best conference facilities in Korea. 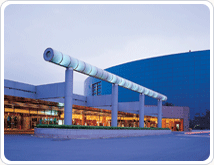 It is the largest and most modern hotel in Daegu where there are few international chain hotels. Nowhere matches it in terms of international standards or business and leisure facilities.